Over the past week temperatures have plummeted and, as December gets frostily underway, London is looking and feeling exceptionally festive. On Sunday I was in Greenwich, meeting old friends for lunch. Having wound through the quaint, fairy-lit streets near the Cutty Sark, I found myself on the narrow path that runs right alongside the river. The tide was fully in and as the wake from the passing boats hit the worn, algae covered steps that run down into the water it cascaded upwards and onto the path in front of me. It is rare that I find myself this close to the Thames and looking at those well trodden steps made me think of London’s past, when the river was the lifeblood of the city, filled not with tourist boats but with barges and wooden river taxis ferrying Londoners from all walks of life to and fro. I love learning about our city’s past and in a place as steeped in history as Greenwich it is easy to imagine the London of old (even if it is a significantly more rosy view than the crowded, sewage-filled reality would have been!) I have always particularly enjoyed reading about Tudor and Elizabethan London – the golden age of Shakespeare, the Spanish Armada and discoveries in the New World. As a child one of my favourite places to visit was Hampton Court Palace, especially at this time of year. Seeing the great kitchens set up to prepare festive feasts was (and still is) utterly magical. The food that I am cooking at the moment, as Christmas approaches, also takes on a distinctly Elizabethan flavour. Meat tends to be slow cooked and heady with red wine, juniper and woody English herbs; and almost everything is liberally peppered (excuse the pun) with spice. For now, the vibrant, sunshine flavours of cumin, coriander and paprika stay nestled at the back of the cupboard. Instead I reach for the sweeter, headier depths of cinnamon, clove, nutmeg and mace. These humble spices that we now so take for granted were worth their weight in gold back in the 17th century and wars were waged in a bid to gain control of the remote, exotic islands where they grew. 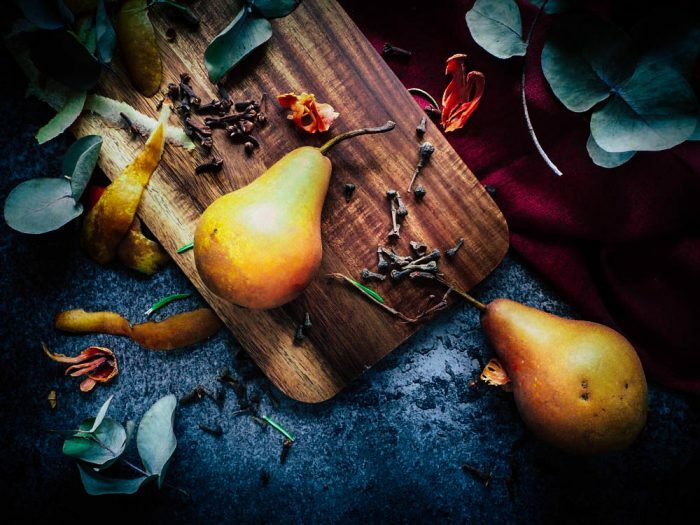 There is something so romantic about the history of these festive spices that, as far back as the medieval times, were commonplace in the English kitchen. 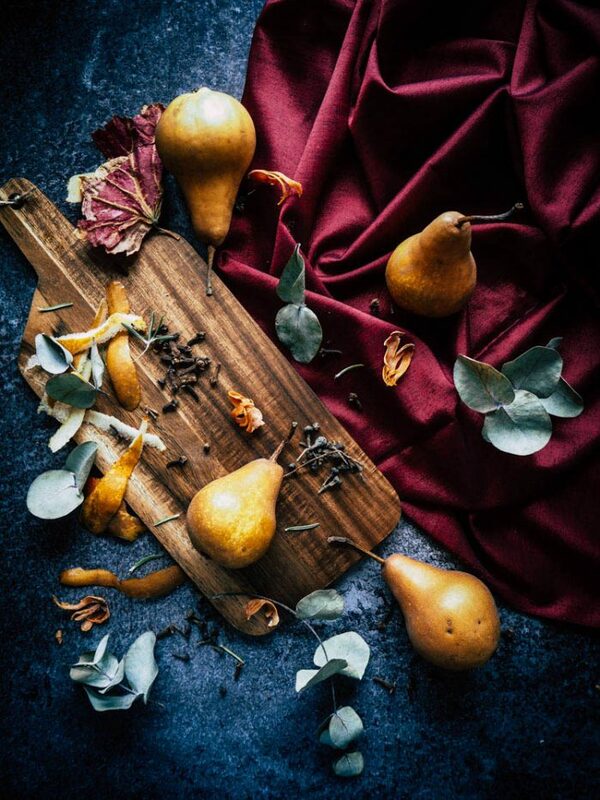 I am constantly on the lookout for forgotten gems: the bewitchingly named grains of paradise, the aromatic warmth of long pepper, or the sweet fragrance of cinnamon berries and cassia bark. Nowhere is the classic yuletide spice rack showcased better than in mulled wine. I love the mulled juices and cider variations that are now on offer in every Christmas market around the city but – in my humble opinion – the combination of spices, fruity red wine and citrus is impossible to top. Over the coming weeks I will inevitably be sinking a pretty hefty amount of the stuff as it is, but I also love using it to make one of my favourite winter desserts. This is a festive take on the French classic Poires Belle Hélène – pears poached gently in syrup until tender and topped with a drizzle of dark chocolate. 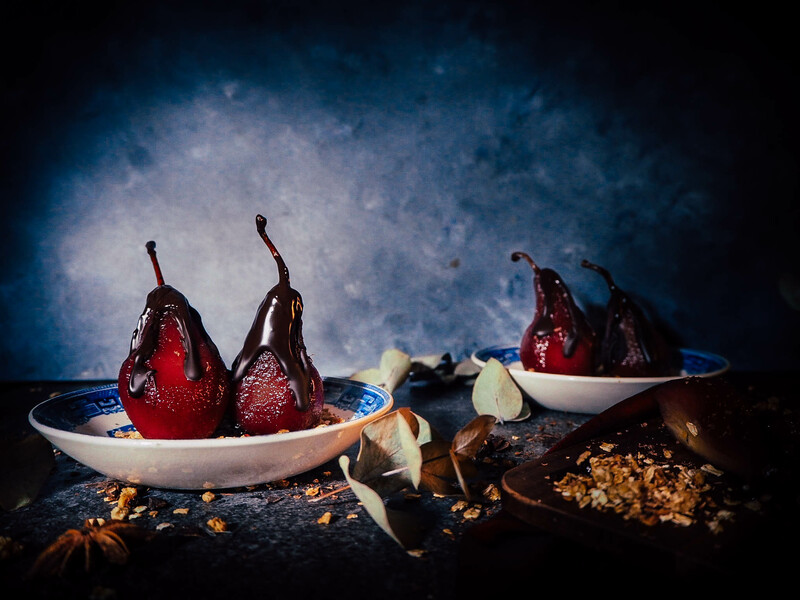 By poaching the fruit (in this case gorgeously golden and medieval looking bosc pears) in my homemade mulled wine they soften to a deep, seasonal, ruby red. Combined with the darkest of chocolates, the buttery, caramel crunch of toasted oats and maybe a generous scoop of vanilla ice cream this for me is the perfect midwinter dessert, steeped in history, romance and the anticipation of the coming festivities – in short, it is Christmas distilled. The best pears to use for this recipe are the firm fleshed varieties, such as Bosc, Commice or Williams, which can withstand the poaching well without threatening to disintegrate. When I made this I used my collection of more old-school spices. As I imagine most people don’t have quite such a nerdy, OTT spice rack I have used more conventional spices in the recipe. If you are feeling adventurous try using cassia bark and cinnamon berries instead of the cinnamon and cloves. Peel and core the pears, leaving the stalk intact for decoration. Trim the base so the pears will stand upright when served. Submerge them in a bowl of cold water with a good squeeze of lemon juice to stop them going brown. Pour the wine into a small saucepan – the pan needs to be big enough to hold the pears but small enough to largely submerge them. Add the sugar, spices, lemon and orange zest, the orange juice and the vanilla. Heat gently until the sugar has dissolved, then bring to the boil. Once it has reached boiling point, reduce to a gentle simmer. Add the pears and place a plate small enough to sit on top of the pears into the pan to make sure they remain submerged. Poach gently until just tender. Very gently remove the pears from the wine using a slotted spoon and leave to cool slightly. For the oat crunch, melt the butter in a small frying pan and add the sugar. Stir over a medium heat until the mix starts to look a bit fudgey. Add the oats stir to coat well. Continue to cook until the oats are well coated and lightly golden. Pour immediately onto a silicone sheet or a lined baking tray until cooled. Try to spread the oats out relatively thinly so you end up with individual coated oats, instead of one mass in the middle of the tray that will need breaking up. To serve, spoon piles of the oat crunch onto the plates and place the pears on top. 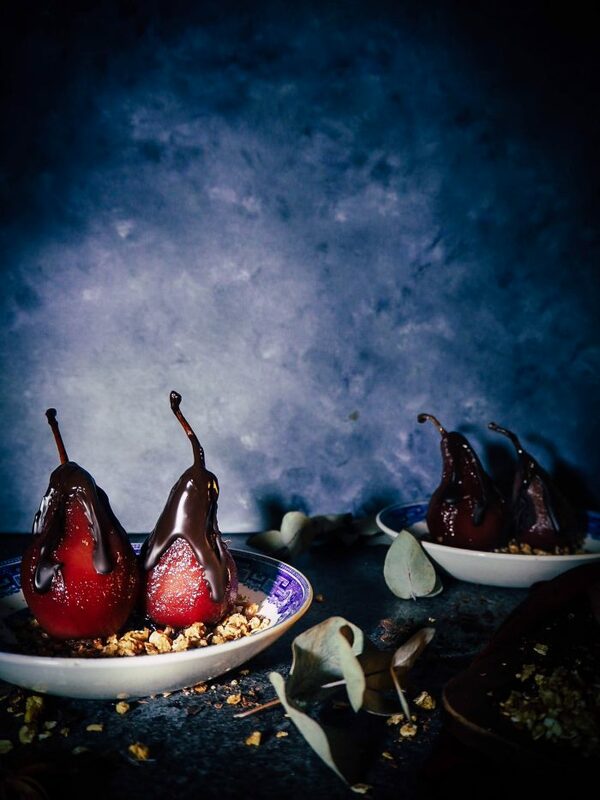 Using a small spoon drizzle over the melted chocolate, so it falls in rivelets down the side of each pear. Serve any remaining melted chocolate on the side.